Check out some of the Bodybuilding.com editors' current favorite things in the fitness and health world! If you're looking for sweet new kicks, workout knickknacks, and convenient items to make your life as a fitness enthusiast so much easier, then hang on to your pecs and check out some of the latest fitness picks our editors currently love. New Balance, which released some of the earliest "barely-there," minimalist cross-training shoes, continues to lead the charge in making versatile, low-profile training shoes. When it comes to the weight room, it's believed that firmer, flatter, and wider features fare better than cushioned, high-heeled, and narrow. The 20v3, which we previously reviewed on Bodybuilding.com, was a fantastic training shoe designed with input from strength coaches. The sole was flat and grippy, and the upper was made of a silky mesh that felt almost slipper-like. To our chagrin, the fine mesh began to tear and disintegrate after just a few months of normal wear. This new generation—the 20v4—addresses this flaw head on. The mesh on the upper is now reinforced with a synthetic overlay, while the seam-free interior is still supple enough to wear without socks—if that's your thing. What the new version gives up in softness, though, it gains back in stability. Make no mistake: This is a performance tool. It's firm and flat enough (with a 4 mm heel-to-toe drop) for all manner of lower-body strength work, but with an updated extra-sticky rubber sole that's adequate for any type of high-speed dynamic work. Lighter and easier to slip on and off than Reebok's Nano line, but tougher and more performance-ready than previous New Balance Minimus models, this training shoe is ready for battle. When hunger strikes while you're away from home, the Isobag Meal Bag System acts as your kitchen fridge away from the kitchen. 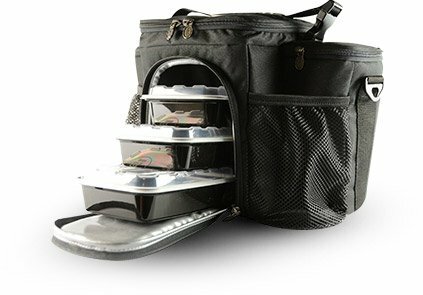 This stylish bag conveniently stores 3-6 full meals, depending on the size of the bag you want. Sure, you can pack protein bars, baggies of protein powder, and trail mixes, but if you know you're going to be running around wildly all day, your body must be hankering for a solid meal—maybe enough for you to succumb to the siren's call of the nearest drive-thru. You've spent so long slaving away in the kitchen, the least you can do is enjoy the fruits of your labor even while you're out and about. Each Isobag comes with its own food containers and ice packs, and a number of compartments for holding other things like hot sauce, utensils, and—if you really want—a protein bar. 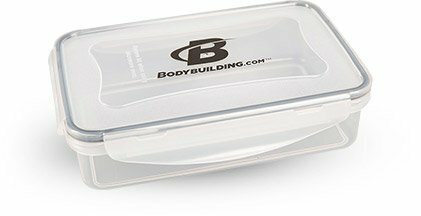 Speaking of eating on the go, did you know about this snazzy Bodybuilding.com plastic meal container? It comes in both large and small sizes, and is compact enough to slip into smaller spaces. The lid clasps onto the bottom in four places, keeping your food fresh and safe from accidental leaks and spills. Just grab the container when you're ready to eat and heat it directly in the microwave—it's microwave and dishwasher safe! A jump rope can be an excellent tool for fitness—boxers know it, and so do 8-year-old girls. Whether your goal is to learn how to jump rope or to become a faster, more efficient jump-roper, (or if you're just tired of the treadmill), the Crossrope 2.0 is an excellent tool. If you want the most variations, springing for the performance set is probably the best bet. 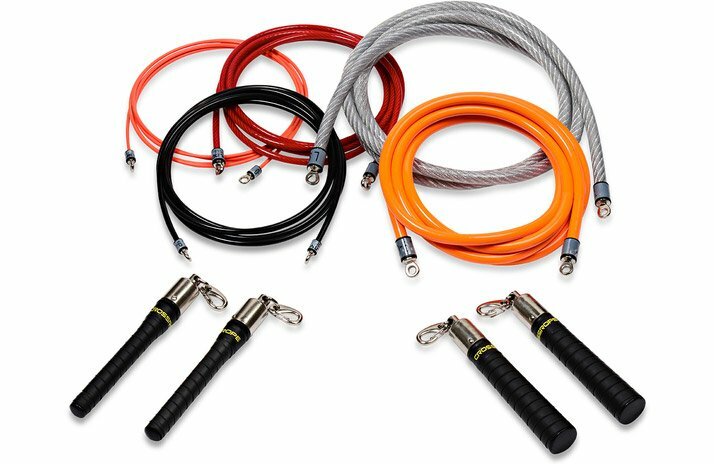 The set includes five ropes of varying weight and two handles, all of which can be mixed and matched to create the perfect jump rope for your goal. Use the speed (3 ounce) and agility (4 ounce) ropes to work on double-unders, speed, and conditioning. The heavier ropes—explode (0.75 pounds), intensity (1 pound), and titan (3 pounds) can be used to train your power, explosion, and strength. Both sets of handles spin smoothly and snap on and off the jump ropes for quick and easy changes. The quick handles are longer, thinner, and free-spinning so you can turn the lighter ropes over with efficiency. The rugged handles work better with the heavier ropes and come with a premium lubricant so they keep turning well. If you're new to jump rope or haven't done it in a while, use the explode rope first. It's heavy enough for you to feel the jump rope and grow accustomed to the rhythm, but light enough to ensure that you won't wear out too quickly. As you improve, employ the lighter ropes to improve your speed and the heavier ropes to make your workouts more intense. The only downers to these ropes are that they hurt like hell if you whip yourself, and they're a little difficult to store. But both of these issues can be solved with a little practice and ingenuity. Well, it's as if the peanut butter powers-that-be have smiled upon us and made P28 high-protein peanut butter (and almond butter) spreads. The spread requires no stirring and is buttery-smooth like classic peanut butter. Purists can enjoy the no-frills, original peanut flavor. For those of us who are more adventurous, the white chocolate and banana raisin versions are simply ahhh-mazing! They seriously can be smeared on everything when you want an extra dose of protein and mmm. Now there's nothing keeping you from reliving your grade-school days of peanut butter and jelly sandwiches—all day, every day. If you're a peanut butter aficionado, P28 is a must-try. Why buy a fitness book when there's so much available for free online? Because there are some things that an article or video can't stretch out enough to cultivate, such as a mindset capable of wading through all the options and assemble a sustainable long-term approach to training. 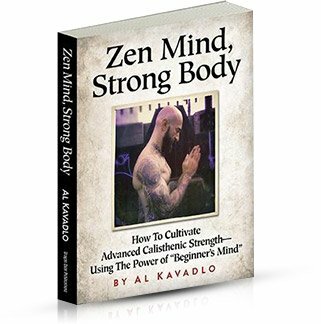 That's the vision of bodyweight expert Al Kavadlo's fourth release, "Zen Mind, Strong Body" (Dragon Door, 2015). Despite the subtitle—" How to Cultivate Advanced Calisthenic Strength—Using the Power of 'Beginner's Mind'"—this work never feels like a dour philosophical treatise. Rather, its wisdom is scattered in aphoristic statements throughout discussions of movement progressions, nutrition, conditioning, and goal setting. At a time when seemingly every other online fitness expert is shouting, "Tell me your goals" in all-caps, Kavadlo muses, "Goals are just a fantasy; the training that you do today is real." But make no mistake. There are tangible, applicable takeaways throughout. He lays out strong bodyweight alternatives to the deadlift, but also provides his personal retort to the question he says he gets every day: "Why don't you have bigger muscles?" There's even a chapter called "Cleaning Up Your Muscle-Up" which calls for—gasp!—"gradual kip reduction" rather hitting you over the head with the increasingly tired "Only losers ever kip" refrain. This is an admirable work that sheds a lot of light on the most common question the rest of us hear about Al Kavadlo, which is of course, "Why is he smiling all the time?" Make a list of all the things "strength" means to you. Then let Kavadlo show you how it can be all of the above, or none of them.